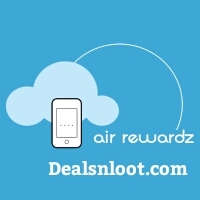 Hello Dealsnloot Readers,Air Rewardz is the app that earns you airtime credit straight to your mobile phone account. Air Rewardz has partnered with your mobile network provider to deliver you this exciting service. Just install and open the apps or follow the offer instructions. You can now also watch videos to earn airtime, by checking out the videos in Video Rewardz. Every time you watch a video you will be credited to your wallet.Grab Unlimited Free Recharge Trick. Update :- Referral link is asking for Password may be this is a Browser Problem, So Please try with another browser to open link and come back to old browser. 8. Even You can Win Free recharge by Watching movies and Download Apps. 1. Download application - Air reward from referral link. 5. You will get 30 rs in your main account . 6. Uninstall the app and install again with your referral. 7. Now change Privacy ids with Xprivacy or DonkeyGuard app & do this process again & again.